A painting by Korea's abstract painting master Kim Whan-ki sold for 5.4 billion won ($4.62 million), the highest price ever paid for a Korean artwork in an auction, a local art sales company said Tuesday. 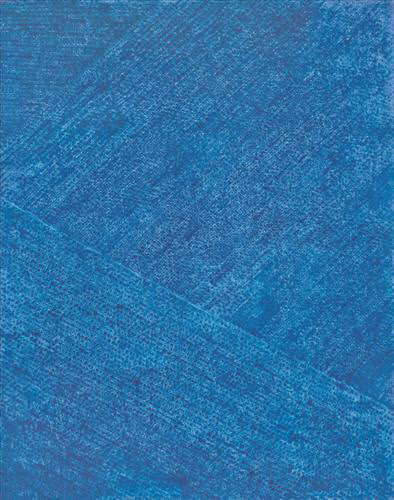 At the K Auction held in southern Seoul, the late artist's "Untitled 27-VII-72 #228" broke the previous record set by the very artist in April, when another of his blue-dotted abstract paintings was auctioned off for 4.86 billion won in the Seoul Auction held in Hong Kong. Prior to the auction Tuesday, art industry insiders anticipated the painting would likely set a new record because of its larger-than-normal size (208 centimeters x 264 centimeters) and its unique style of the diagonal dot patterns that set it apart from his similar paintings. They expected it to be auctioned off in the price range of 4.5-6 billion won. An official from K Auction said the pattern's direction adds tension and liveliness to the painting. The auction started at 4.5 billion won, but the price quickly escalated amid heated competition. The four most expensive Korean artworks traded at auctions all belong to the late artist. The third most expensive is "9-Ⅶ-71 #209" from 1971, going for 4.72 billion won, followed by "Untitled 3-V-71 #203" also from 1971 at 4.56 billion won. "Kim Whan-ki raised the profile of Korean art in the global contemporary art scene, and he expressed the very Korean sentiment in his abstract art," said Kim Dal-jin, director at the Kimdaljin Art Archives and Museum.